(Leah Hogsten | Tribune File Photo) Participants, including Team FLDS, run along the route of the 6th Annual Salt Lake City Urban Iditarod, Saturday, March 2, 2013, throughout downtown Salt Lake City. Teams of of mushers pulled sleds in the form of shopping carts from watering hole to watering hole. Moments after the Utah Jazz lost Game 5 of their playoff series against the Oklahoma City Thunder, a Twitter user offered some comical perspective. The joke was a hit with a key demographic for such comedy — polygamists. “I think most can laugh at themselves,” Joe and Alina Darger said in an email to The Salt Lake Tribune. “Take my word for it, ten or eleven wives is all you need — never go over it,” Twain quotes Young as saying. The jokes Utah Jazz fans are reading on social media this NBA playoff season are much like the ones Brigham Young University fans hear and read every time their teams travel. BYU is owned by The Church of Jesus Christ of Latter-day Saints, which officially abandoned polygamy in 1890 and excommunicates members found practicing it. That hasn’t stopped the polygamy jokes. Sometimes, faithful members of the church even participate. A 2005 profile in The Atlantic of then-presumed presidential candidate Mitt Romney included a joke he told at a St. Patrick’s Day breakfast in Boston. “I believe that marriage should be between a man and a woman and a woman and a woman,” Romney said. People who actually grew up in polygamy get in on the act, too. Lance Allred, who grew up in the polygamous community of Pinesdale, Mont., and went on to play in the NBA, offers a dim view of plural marriage in his public speaking engagements. He still cracks a few jokes. In a 2016 TedX talk, Allred recalled the large number of women in his parents’ wedding video — his mother’s mothers and his father’s previous wives — and how NBA teammates would be excited to find a nightclub with a ratio of three women to one man. The teammates would try to get Allred to go to such clubs. “And I’m like, ‘I’m good,’” is Allred’s punchline. Arizona polygamist Moroni Jessop has read the jokes made on Twitter during the Jazz games and says they are hilarious. Sure, the jokes come mostly from a lack of understanding, he says. Jessop isn’t even bothered when people put on prairie dresses and go as sister wives for Halloween. Anne Wilde, who was a plural wife for 33 years until the death of her husband, doesn’t find polygamy jokes funny, generally. In an email, she said the ribbing tends to be unoriginal and spreads the misconception Utah law allows polygamy. 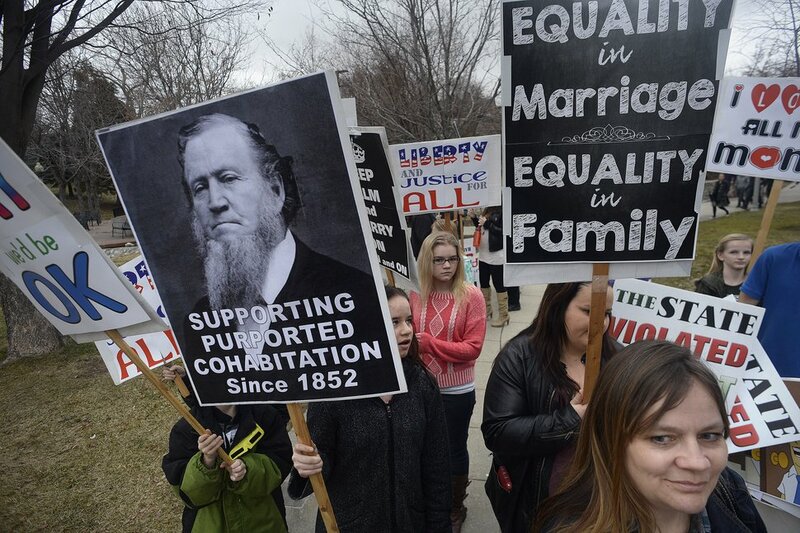 Scott Sommerdorf | The Salt Lake Tribune Polygamists and their supporters assembled at City Creek Park prior to their march to the Capitol where they held a rally, Friday, February 10, 2017. 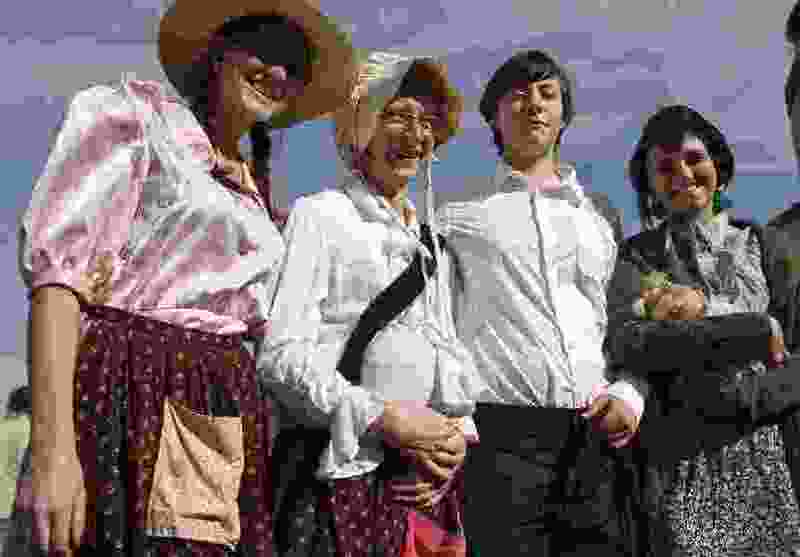 Prairie dresses remain the preferred attire of women and girls in the polygamous Fundamentalist Church of Jesus Christ of Latter-Day Saints. Although FLDS members represent a fraction of polygamists across the West, they have received the bulk of attention, largely because of their leader, Warren Jeffs, who is serving a prison sentence in Texas of life plus 20 years for sexually assaulting two girls he married as plural wives. Drew Briney, one of the husbands seen on the reality television show “Seeking Sister Wife,” said the FLDS have driven many of the stereotypes about polygamists, and jokes marginalize polygamists. He points out that jokes making fun of other religions and sexual persuasions have been deemed socially unacceptable. Even still, Briney offers a funny polygamy joke from Twitter — from when then-Utah Jazz player Jeremy Evans was participating in the 2012 NBA Slam Dunk Contest.